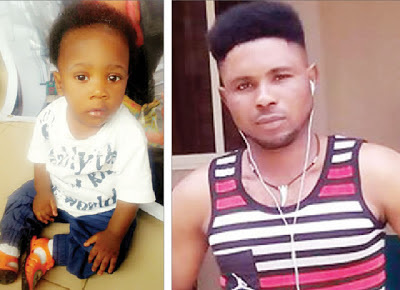 An unemployed young man, John David, has left a couple –Abdulrahman Balogun and his wife, Bunmi – in sorrow after he allegedly abducted their 10-month-old boy. David and the couple live in Okokwu community, Port Harcourt, Rivers State. Punch Metro learnt that David had pretended to be playing with the kid, Richards, on their premises last Sunday around 7pm and eventually fled with him. It was gathered that Abdulrahman and Richards were set to leave for a church service that day, and Abdulrahman were waiting outside for Bunmi to dress up. Abdulrahman, who spoke to our correspondent on the telephone on Monday, said he had gone inside to hasten up his wife as they were running late for the service. “David came to play with him. I went inside to call my wife because we were almost late for the church programme. When I came outside, I could not find David and my son in the compound. “We searched for them everywhere on the premises, but we couldn’t find them. I called his phone number and it indicated that it was switched off. He started living here five months ago,” he said. The father, a teacher, explained that he subsequently reported the incident at the Mile 3 Police Station, adding that he discovered that the abductor had been bearing a fake name in the neighbourhood after he ran a check on his profile on Facebook. “His name on Facebook is John Elvis David but we know him as Davies. He moved to this area five months ago. His three friends who lived with him have been arrested by the police. “A woman called me yesterday (Sunday). She said she and David boarded the same bus in Warri around 4pm and that she saw him with my son. She said she was surfing the Internet after she arrived home when she read the post on Richard’s abduction on social media. She said she would have raised the alarm if she had read the post while she was on the bus. “We got married October 2015. That is our first and only child. We are appealing to the public to assist in tracking down the abductor,” he added. The Police Public Relations Officer in Rivers State, DSP Omoni Nnamdi, promised to get back to our correspondent, but had yet to do so.